Coat three small bundt cake pans (4 inch) or 1 large bundt (about 9 inches) with a bit of coconut oil. Set aside. Mix chia seeds and water and set aside for 10 minutes to make "chia eggs." Preheat the oven at 350°F. Sift the teff flour, oat flour, baking soda and salt in a large bowl. In a separate bowl, whisk together the yogurt, milk, lemon juice, lemon zest, maple syrup, vanilla and chia eggs. Transfer batter into prepared pans. Bake for 35-40 minutes or until an inserted toothpick comes out clean. Allow to cool in pan at least 30 minutes before removing. As the cake bakes, bring the raspberries, water, and coconut sugar to a boil and cook 25 minutes stirring and mashing occasionally. Strain out the seeds and let thicken in the refrigerator. 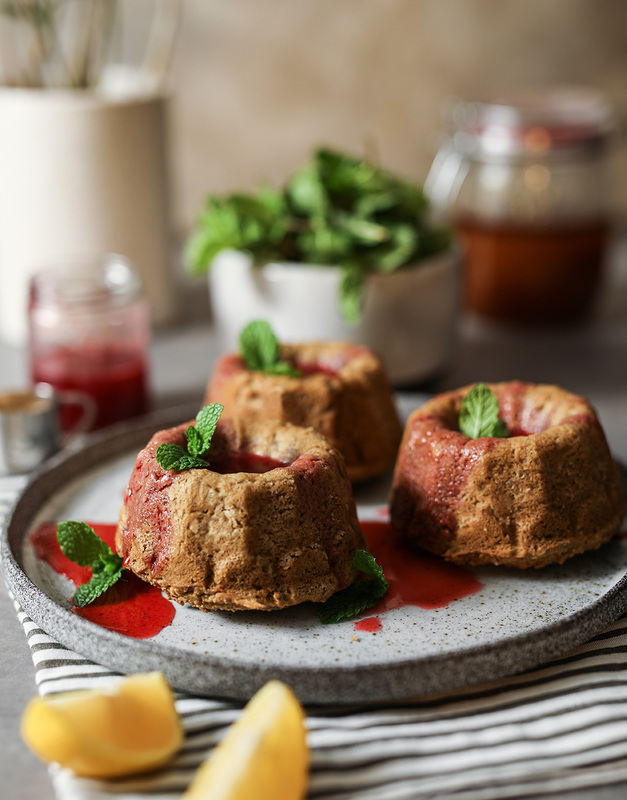 Serve cooled bundt cake with raspberry syrup and mint leaves.